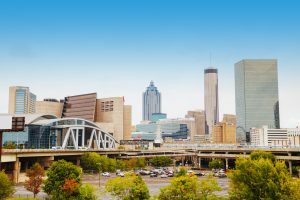 If you are looking for cheap properties in Atlanta where you will be close to downtown and surrounded by a spirited environment, the Mechanicsville neighborhood may appeal to you. With a commute under 10 minutes to the heart of the city and the excitement, Mechanicsville is a great place to look at real estate if you want to get to know Atlanta and enjoy its energy. The neighborhood’s top qualities do not only encompass its abundant supply of nightlife entertainment and inexpensive houses. Since it is so close to downtown, many surrounding parts of Atlanta are also within close reach, including three central colleges with students who might be looking for places to live. Homes in Mechanicsville are very affordable, and rental prices are even more so, which could explain why almost 90 percent of the residents in the neighborhood are renters. Residents interested in Mechanicsville can find homes, apartments and manufactured houses throughout the neighborhood, both for sale and for rent. The average value of houses in the area is $99,500,while the median rental cost of real estate is $745. Many of the houses available are older builds with dated amenities but some newer homes with more modern upgrades are also available. Prices of the neighborhood’s single family homes for sale can begin under $50k for an older 3 bedroom or 4 bedroom fixer upper house. In addition, houses with three or more bedrooms that were built more recently and have more updates can cost anywhere from $100,000 to $215,000. Many housing lots are empty and waiting for a buyer to build. These open lots of land usually sell anywhere from $25,000 to $60,000, depending on the size. Multifamily apartments for rent in Mechanicsville are regularly priced, starting at $880, and go up to $1,640. The monthly cost of 1 bedroom apartments typically ranges from $880 to $920. Apartment prices in Mechanicsville for 2 bedroom rentals begin around $850, and reach up to $1,640, monthly, while 3 bedroom rentals begin at $1,200, and go up to about $1,350. The difference in costs is normally dependent on the newness of the home and its amenities. Public transit stops on MARTA are placed throughout the center of the neighborhood for residents in Mechanicsville who need transportation to downtown or other areas of Atlanta. Mechanicsville is very close to Georgia State University, Spelman College and Clark Atlanta University, so it is likely that students may take advantage of the cheap rentals in the area. The neighborhood also offers a decent collection of grocery stores, green spaces, eating and shopping places for residents and college students. Because of its affordability, young professionals and college students looking for real estate in Atlanta would be great fits for the Mechanicsville neighborhood. The cheap housing selection could also appeal to some low-income families, but Mechanicsville has a low “C-“ grade in educational support, and the same for family wellness. On average, Mechanicsville residents make about $18,760, and just over half of the residents have obtained – or are working toward – college degrees. Those searching for houses on a tight budget that still want to be close to the nightlife in downtown Atlanta will find Mechanicsville might be the right place for them. With an “A+” grade in nightlife, there is an endless amount of activities to keep young people entertained.